Blog home / Everything CBTN / Networking Basics: What is the OSI Model? The Quick Definition: The Open Systems Interconnection model (OSI model) is a conceptual model that characterizes and standardizes the communication functions of a telecommunication or computing system without regard to its underlying internal structure and technology. The seven layers are: Physical, Data Link, Network, Transport, Session, Presentation, and Application. If you poke around the subject of the OSI model, you’ll find varying opinions. Some argue that it’s outdated because it doesn’t fit current networking protocols. Besides, the OSI model is theoretical, right? But hear us out. If you’re studying for CompTIA Network+ or Cisco CCENT certification, you’ll likely be tested on the OSI model. In the IT field, you’ll hear vendors pitch their products by discussing which layers work with each project. 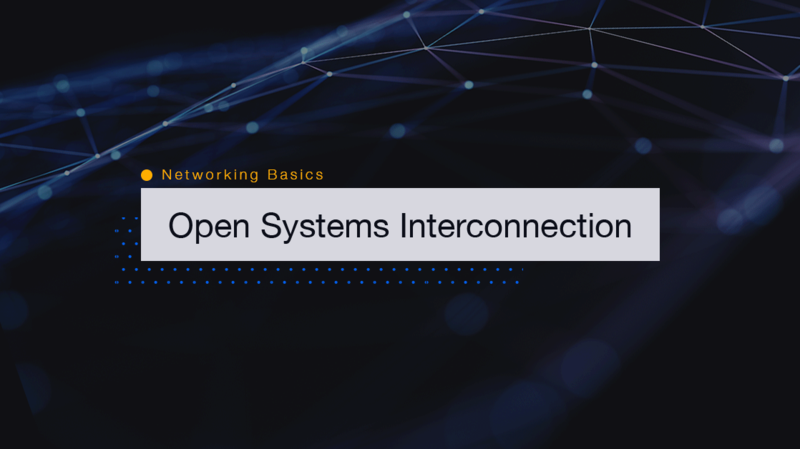 The bottom line is familiarity with the OSI model enables you to understand how protocols, devices, and applications interact with each other. This is especially handy when new technologies hit the market and pique your organization’s interest. OK, now it’s time to take a look at each of the seven layers of the OSI model. This layer is the physical representation of a network. It includes everything from cable types to pins. When there’s a network issue, the first thing IT pros usually check would be physical layer elements such as the power plug or the network cables. Switches and hubs operate at this layer within most networks. Node-to-node data transfer and error connection (from the physical layer) is handled at Layer 2. It’s also worth noting that at Layer 2 two sublayers exist: the media access control (MAC) and logical link control (LLC) layers. Now we’re getting to the good stuff! Layer 3 is the crux of router functionality. Packet forwarding and routing happens at this layer. Let’s say you’re based in Washington DC and need to connect to a server in Seattle. There are millions of paths to choose from — and routers at the Layer 3 level make this process quick and successful. How much data needs to be sent? At what rate does it need to be sent? Where is it going? How is the traffic segmented for efficient delivery and put it back together? There’s a lot that needs to be considered when it comes to data transfer. Fortunately, Layer 4 handles the data coordination between hosts and systems. You’ll encounter the Transmission Control Protocol, commonly referred to as TCP, at the Transport Layer. This protocol is is built on top of the Internet Protocol (IP), which is known as TCP/IP. TCP port numbers work at Layer 4, while IP address work at Layer 3, the Network Level. You’re likely familiar with the ol’ saying, “It takes two to tango.” Well, in the world of networking, it takes a session for two devices to communicate with each other. It’s at this level that session setup, how long systems should wait for responses, and terminations between applications at the end of sessions occur. At some point, data has to be translated from networking format to application format or vice versa. So, think of this layer as “presenting” data to application or network. A prime example of this would be the encryption and decryption of data for secure transmission. This all happens at the Layer 6 level. We’ve finally reached the only layer non-IT folks care about: Layer 7. End users directly interact with applications that work at the Layer 7 level. We all use web browsers like Chrome or Firefox, which are Layer 7 applications. And speaking of apps, any of them like Microsoft Office or ESPN also are Layer 7 apps. While conceptual in nature, the OSI model can come in handy on the job. If there’s an issue with a network, having a visual map of what’s occurring can help IT pros narrow down the problem. For example, is it a physical layer or an application layer issue? Another example of the OSI model being helpful is within the programming realm. To create a successful app, programmers should know what layers will interact with their apps.